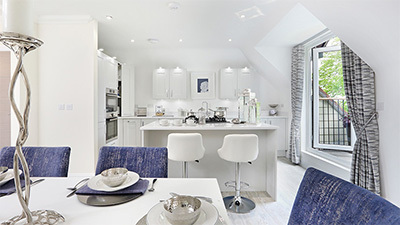 Browse the latest new homes by Beechcroft Developments nationwide. The company is committed to building retirement properties ideal for those looking to live in energy-efficient homes that are easy to maintain. Beechcroft offers homes with spacious rooms, a high level of security and landscaped settings. Each of its developments offer residents easy access to local shops and amenities and an estate management service. It is also known for its non-age exclusive Special Projects. The Special Projects division specialises in developing new homes in buildings with historical or architectural interest. This often involves the restoration and conversion of listed buildings, and the addition of new build apartments or houses. The housebuilder has collaborated with Move With Us which removes the stress of the sales process for the buyer. The team will manage the marketing and sale of the buyer’s home in order to make the process of purchasing a Beechcroft home smooth and straightforward. Choose a Beechcroft Developments development in this area.